"The Origin of the Martian Manhunter"
In the Flash Museum, Ralph Dibny goes into storage and takes something from the Anselmo case in 1995. Alfred lights up the Gotham Christmas tree. 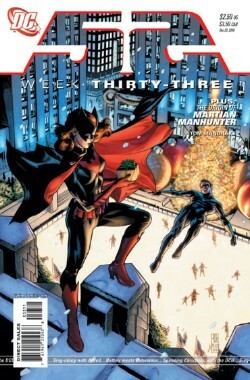 Batwoman stands on a nearby roof, and is startled when Nightwing appears, bearing a gift. He gives her a batarang, which she seems displeased with until he reveals it's one of the high-quality official batarangs, that can survive extreme vigors. In Metropolis, Lex Luthor finds that he's still incapable of meta enhancement. He asks for a sign that his efforts will be rewarded, and a patient of the program who is near death (because he is unable to accept the metagene) is suddenly revealed to be clinging to life. Luthor, reinvigorated, tells them to kill the boy and find out what mutated him into capability to accept the x-gene after all, ignoring the blessing of his survival. Charlie, delirious from the onset of his cancer, staggers about in near-delirium, saying clue-like phrases in a nonsensical fashion. Renee puts him to bed as he sees people from his past, telling him that she loves him. Outside, watching the night, Renee and Kathy kiss. Across the DCU, people celebrate Christmas in their own fashions in a double splash. Black Adam goes to the Justice Society and depowers with his family, to show that beneath his powers he is a human like everyone else, and makes gestures of peace. Watching this, Amanda Waller and Atom Smasher organize the new Suicide Squad, and prepare to take the Black Marvel family apart. Main Story - 4: This issue didn't really move the plot forward any way, and a lot of the issues lately have been more filler...it's getting to feel like a television series, where you know there's a big finale coming, but we're still ten issues from where it starts winding up. The inevitable lull. BUT, that said, in the middle of this lull are some supreme character moments, and though issues have been hit and miss of late, the character moments add up and keep the series vital. Here, we have a few great character moments that make up for the lack of plot motion. They've been working the Black Marvel family toward redemption, and here's another character step. As I said, I'd have been upset had Marvel been just accepted, but I looks like story-wise like they're setting these guys up for a fall. I'd be surprised if, at the end of this series, the Black Marvel family is still around. I haven't seen them in One Year Later that I know of, and they seem like the obvious motivation for a destructive World War Three they've been hinting at. These quiet character moments make the anticipation or their fall or redemption greater, and good conflict. I like seeing that Amanda Waller had a step from imprisonment to Checkmate, and the connection to the series here. Charlie's near-death was touching, as was the motion from near-blows to lovers again for Renee and Kathy. I don't know that the connectivity between friends to lovers made a to b for me in terms of plot, but then, this series banks on the passage of time, and given that they were previously romantic it's not some huge plot leap, like say Starfire kissing Lobo or something. Luthor's scene was prime...they always play with his arrogance, and that's what most people see as his chief failing, but I also see his na�ve, short-sided optimism, and both are present here. You almost hope he could get powers, which is kind of scary, and should be. That's what Luthor is, a guy you shouldn't identify with, but might, if he's written right. Like Vader, the Emperor, etc. The Suicide Squad is interesting, and I'm surprised to see how Persuader factors in, along with the new Captain Boomerang. All in all, still chugging along. I hope for some plot motion soon, but we can't expect much until Charlie either dies or heals, the Black Marvel thing comes to a head, and the space folk confront the Lady Styx. Art - 5: Still strong, consistent, pretty uniform, and not lacking in any detail. I don't really have any complaints for this art, it captures the spirit of the story in incredible detail for the schedule. Good work. Back-Up Story - 3: The writing is a five, given the space and the knowledge required. The new Martian Manhunter (seeing as I'm rating the story, too) is a 1. I'm really not enjoying the brooding, angry, ugly, mean Manhunter. I've been checking out the comic, scanning it (not reading it, an important point for fairness), and it appears he's found a new group of survivors, adopted his old look, and taking to being unusually brooding and cruel. I'm just not enjoying it. As this origin pops into that, and encourages it, thus the point drop. Back-Up Art - 5: Per typical, a faithful reimagining of the concept, and brief, so very hard to knock. Good work. Cover Art - 5: The image is beautiful. At first you look at it and say, "Holy crap, she didn't like his present, so he's committing suicide!" But then you say to yourself, "Man, Nightwing can just leap backwards like that and KNOW he's gonna be all right" and it starts to capture the power of god-like men on Earth, the fantasy of comics. So doubleplusgood.